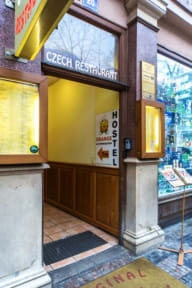 Hostel Orange, Praga, Czechy : Rezerwuj teraz! I travel a lot, I've been at many hostels. Orange is situated in the heart of Prague. Staff is very friendly and helpful with high English level. They provide breakfast and for sure it will not ruin your budget. Nice atmosphere! High quality hosteli in the center of Prague. It is not the cheapest but clean and with a lot of facilities. Location couldn't be better. It's close to the old town and most of interesting places. Great value for money when booked online. Bathrooms were always busy and the kitchen/social room not the greatest. But I will highly reccomend it to everyone who looks just for place to sleep. We spent over 3 hours in reception, because of a non-existent point of the regulations about payment of deposit. We were informed about it after we regulated the bill, and the Manager of Hostel was kind of joking about us, does not want to solve this problem, quoting on the completely different point of regulations. When we decided to exchange currency to pay the deposit, it emerged that, in our room, somebody is booked. The manager is completely unconcerned in problems of customers.